The latest release from London-based publisher SelfMadeHero, Ruins is a truly beautiful piece of storytelling which provides a deeply believable insight into the complexities of a married relationship. Written and illustrated by Peter Kuper, the story centres around Samantha and George, a New York couple who are spending their sabbatical year in a small Mexican town called Oaxaca, hoping to rekindle their failing marriage and find the inspiration they need to revitalise their flagging careers. The layers of symbolism and subtext contained within the story are truly staggering, and Kuper takes his time in gradually peeling back these layers as the story slowly progresses. The recurring theme of insects is present throughout, from the ones George obsessively studies and photographs, even to the detriment of his own marriage, to the ever-present scorpion that lurks in their apartment. Kuper also draws on his own experiences from his time spend in Oaxaca, using the social and political upheaval of the time – corrupt governors, striking teachers, violence and protest on the streets – as a powerful backdrop to what is otherwise a fairly intimate story. Undoubtedly the most powerful piece of symbolism utilised here however is the frequent breaks that Kuper takes from the ongoing narrative to check in on the arduous migration of the Monarch Butterfly as it makes its two thousand mile journey from Canada to Mexico. The parallels between its struggle and our own struggles as a society – not to mention those of Samantha and George as a couple – are profound, and its journey gives the book an added emotional resonance as we watch it overcome obstacles and witnesses poverty, violence and deprivation during the course of its long, thankless journey. Kuper’s artwork is stunning throughout, adopting a fairly cartoony approach to the telling of the story but never losing any of the emotional heft in the process. Perhaps the most impressive aspect of the art is the striking use of watercolours, ebbing and flowing from muted interior shots to the bright, vibrant streets of Oaxaca, with several of the pages feeling like an almost tangible tangible wave of light, colour and energy. The characters themselves are undoubtedly striking, but it’s the backgrounds here that really impress, from bustling marketplaces to crowded beaches to a simply jaw-dropping butterfly sanctuary which Kuper employs a wonderful extra little ‘trick’ in order to fully capture. Reading this book, it’s difficult not to find yourself becoming fully immersed in Samantha and George’s lives, watching the cracks in their relationship gradually form as they slowly drift further and further apart. There’s a sense of frustration too as we have to watch them make mistakes that could easily be avoided, driving wedges between one another where none should necessarily exist. As the story progresses we find out more about Samantha’s past and the tragic demons that plague her, giving a whole new perspective on their marital problems. George on the other hand remains more of a closed book, a man struggling to find his place in the world and turning inwards instead of outwards; his reluctance – fear, even – to drive serving as a perfect microcosm for all of his quirks and insecurities. There’s an innate relatability to Kuper’s writing that draws you in; the wonderfully three-dimensional characters that make this feel like so much more than a beautifully illustrated book about a town in Mexico. As the story gradually reaches its conclusion, Kuper’s firm grasp of sequential storytelling could not be more apparent. After all, this is a man who has been teaching comic courses for over twenty-five years, as well as serving as a visiting professor at Harvard University, and based on the steady hand he displays here, I can absolutely see why. The political overtones are woven into the story in a truly accessible way, never feeling preachy or forced, and the waves of emotion that wash over you while reading – sadness, elation, anxiety, warmth – are all perfectly realised. At its heart, this is a story about a relationship. About a couple trying to figure out their future and decide if they actually even have one together. I can’t think of anyone who wouldn’t find at least something in this book to relate to, whether it’s the frustration of Samantha, the anxiety and obsession of George, the powerful political overtones viewed from a grassroots level, or simply the utterly gorgeous artwork. 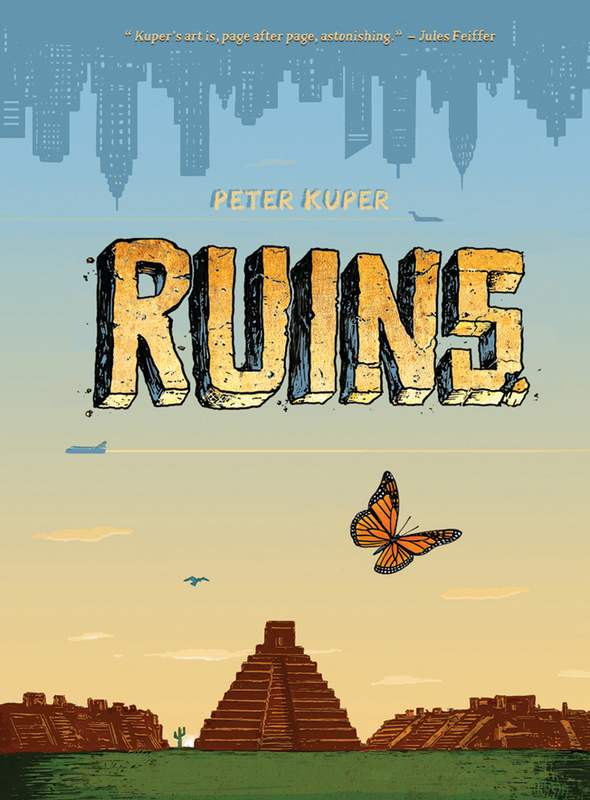 SelfMadeHero continues to churn out spellbinding books at an almost dizzying pace, and Peter Kuper’s Ruins has to be placed right near the top of their ‘must read’ particular list. By turns charming, moving, funny and upsetting, this is a book that simply has to be read.